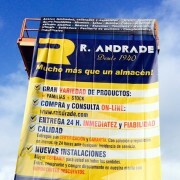 Our most historic company, R. Andrade, bursts into the Internet with the launching of its brand-new online store. With products that go from all-kind metals (irons, steels, tins, aluminum, etc.) to screws and die-stamping, going through plastics, foams, etc. it presents itself as one of the most varied choices in the online outlook of the sector. In addition, it incorporates a pioneering element that allows the maximum adaptation to the customer’s needs allowing, from the proper online platform, the customization of each piece with self-made cuts, being able to define lengths, diameters, etc. within any of the numerous product families. This landmark joins the rest of the changes the company R. Andrade has been subjected to, since its incorporation to Meifus Corp, such as the location change, the new incorporations in human and product terms, the image renovation or the financial sanitation.